Deep, evergreen, shining leaves. 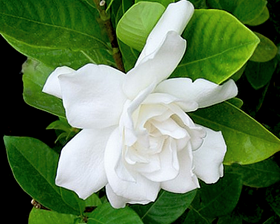 Heavily scented, double creamy-white blooms. Height: 60-180cm. Seeds are usually sown in mid winter - early summer. One way of growing this plant from seeds is to keep the seeds in peat moss and maintain a temperature at 21-27C. Seeds take 4-6 weeks for germination. You can also sow the seeds in trays or pots with a good sowing mixture and maintain a temperature of 21-24C. Seeds start germinating within 45 days. Make sure that the soil is fertile. Average watering and partial shade will work well.